Just wondering what gives the City Manager Christine Burns the right to pick and choose what city ordinances to enforce? The city has an ordinance for shoveling the snow on the sidewalks in town and especially Main Street. When was the last time they wrote a ticket for not shoveling? Red Flannel Day showcases the city and businesses, and when visitors return around the holidays to shop and eat they find snow on some downtown sidewalks, with curbside snow high enough it prevents them from opening the passenger doors. The piles of snow on Main Street are high enough that people who do shovel have no place to put it, as the city waits for spring to melt the snow. Let’s take care of your own house before you worry about someone else. Maybe you could use the American Legion Hall lot for the snow. I’m snow excited. . . Kids weren’t the only ones happy to have a snow day from school on Friday, February 24. The snowman on the right was so excited to see some new snow that he did a handstand! 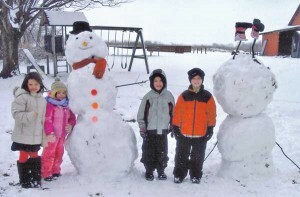 Kimberly Cartwright’s grandchildren, Kiley, 6, Makenna, 3, Riley, 6, and Kaleb, 9, had fun building their snowmen at grandma’s house on their day off school. Send us your winter photos! Send them to news@cedarspringspost.com, mail them to us at PO 370, Cedar Springs, MI 49319, or drop them at our office at 36 E. Maple in Cedar Springs. Last week we featured flowers blooming in January because of the unseasonably warm weather. There’s no danger of that now! Several inches of snow fell over the weekend, causing a snow day for schools on Friday, and slippery road conditions Monday. According to WOODTV 8 meteorologist Bill Steffen, more snow is on the way for this weekend. 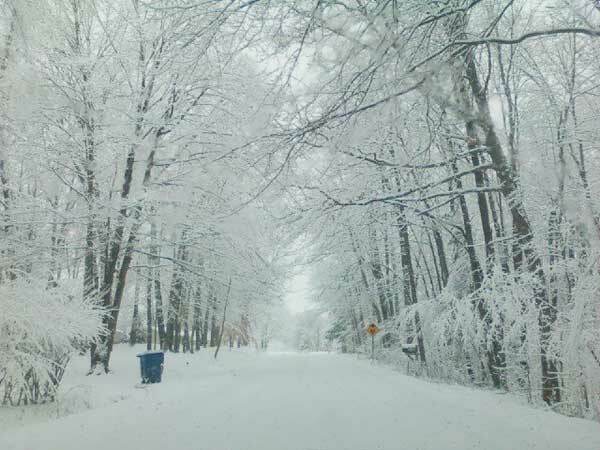 Mary Cain, of Solon Township, took these beautiful photos after the snowfall last weekend. Thanks, Mary, for sharing them with us! 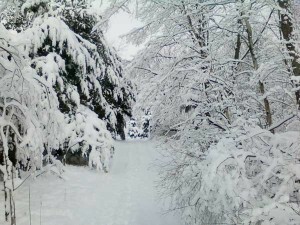 If you have winter photos you’d like to share, email them to news@cedarspringspost.com. The scene on US131 at the Jefferson/Morley exit Sunday during the snowstorm. The last traces of the late January blizzard were just melting away when Mother Nature dealt us another blast on Sunday, February 20 and into the early morning hours of Monday. Heavy snow, winds, sleet and freezing rain made traveling dangerous, and caused accidents on US131 near the Morley/Jefferson Road exit Sunday afternoon that involved 50-60 cars. The highway was shut down for several hours during the cleanup. According to the National Weather Service in Grand Rapids, the Cedar Springs, Sparta, Sand Lake area received 8-10 inches of new snow. Schools across the area were closed both Monday and Tuesday. It’s every little girl’s dream is to have a castle of her very own. That dream came true for two girls from Sand Lake last week. Greg Pease, with his daughters, Ashlee and Jewelea (twins, age 7), from Sand Lake made great use of the all the snow we got last week—they made a snow castle using a 10 gallon rubbermaid tote, and had to fill it 76 times! Afterward they sprayed it with red food coloring. A big thank you to their mom, Jamie, for sending in their photo! Do you have winter fun photos? Send them to us at news@cedarspringspost.com, with a short description, and you could see them in the paper or online. Daniel Ojeda Juarez, 17, a Cedar Springs High School Rotary exchange student from Mexico, is shown here with the first snowman he’s ever made. According to Anna Bekins, their yellow lab Zola sat there for about 15 minutes after Daniel was done making the snowman, just watching and waiting for the carrot to drop! “She wanted that carrot really bad,” said Anna. Do you have winter snow or fun photos? Send them to us at news@cedarspringspost.com. Emily Pierson is all smiles in her newly made igloo on January 18, 2011. Paige Pierson peeks out from her igloo fort made on January 18, 2011. Lily loves to play in the snow. Photo by Judy Reed. Lily enjoys the snow. Photo by Judy Reed. Michigan weather is like a box of chocolates, you never know what you’re going to get! Monday and Tuesday Cedar Springs got about 3 inches… or more. Depends on if you were standing in a snowdrift or not—or maybe in a ditch. Snow is also predicted in the future for area residents—at least until June. Reader reminder: If you’re out there, either having fun or waiting for a tow truck, take a photo and send it to news@cedarspringspost.com. Deadline for the weekly issue is Monday. Drive safely!